knottiea6945a88bb902f2c, knottie30909c941e462c05, knottie1f0849a50bc0c119, knottieb6f6ac2dd56e3b47, ravoshing and 133 others joined. prenatalnovak, Knottie42510648, knottie22948f5504311bae, knottie0ae14c3fa03ef909, alh8606 and 13 others earned the Photogenic badge. prenatalnovak, aglasgow4, knottie22948f5504311bae, knottie0ae14c3fa03ef909, alh8606 and 115 others were promoted to member. Ohhhh ladies. Do I have a birth story for you!!! I got my membranes swept at 11:20 this morning and had been having contractions all afternoon but I wanted to stay home until my water broke. H comes home with dinner around 7:30. I eat all while having bad contractions. I tell him I'm pretty sure tonight's the night but I want to get in the tub for a while to be sure they're not BH. Very quickly afterwards they get to be unbearable and I tell him we need to go and I feel like I need to push. We live 12 miles from the hospital and halfway here I push and my water broke. He's going 100 on the highway trying to get us here. We call to let them know we're coming. We get off the highway at 9:02. I tell him I need to push and he's telling me not to (HAH!!). We pull up to the door and he's able to get in because someone was walking out. The doors lock at 9 and the registration desk shuts down then too. He gets on the phone to tell them I'm in the car with broken water and is soon met with a team of staff. What they don't know is that I really had to push and I felt her crowning. I pulled down my leggings and felt her head. I pushed again and her head was out. 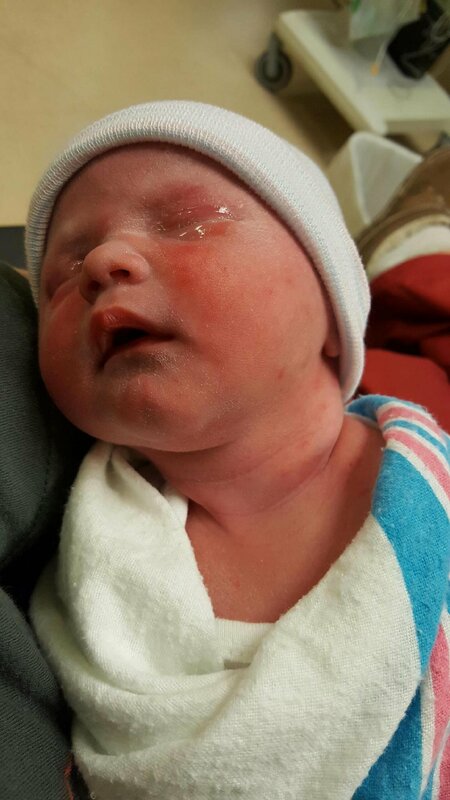 I pushed a third time and delivered my baby girl all by myself in the car 25 feet from the hospital door. She was taken to nicu for testing and should be back here in my room any minute. She was born at 9:08 weighing 7 pounds 7 ounces and is 19.5 inches tall. Ecstatic for you, @DrillSergeantCat!! I'm sure it wasn't how you planned things, but that baby is beautiful! WOW that is quite the birth story! Congratulations, she is beautiful. And you are completely badass. Omg that is one crazy birth story! Amazing and congrats on your beautiful baby girl! Omg that's quite the birth story! So happy for you! She's gorgeous! WOW, what an experience! Glad she got safely into the world! WOAH! @DrillSergeantCat that is amazing! Norah is beautiful! Congratulations on both her arrival AND delivering her yourself, I hope you are both doing great and going home soon!! Oh my god you rock! Congratulations mama!! Norah is gorgeous! Whoah, that is just absolutely amazing!!! So glad for her safe arrival and kudos to you for delivering her all by yourself! That is super impressive! That's amazing!!! And so is she. Congrats mama! Ahhh!!!!!!!!!! That's quite an entrance she made!!! I'm SOO impressed by you & your strength & just knowing what to do - you're incredible!!! She's beautiful & I'm so happy for you!!!! Congrats!!! Crazy!!! What a memorable story you have! Glad you are both doing so well! Congrats! What a crazy story! Wow! Awesome @DrillSergeantCat That is a great birth story and way to be amazing throughout! Holy moly! What a story. That's amazing. congratulations to you and your family! Congrats!! My coworker had the same birth experience. You are a rockstar!! She's a beauty! Bewildered. He looked in and saw me sitting there holding her to my chest and looked confused at first then scared. It was amusing. Holy cow!! That's insane! Way to kickass, mama. She's gorgeous. Welcome Norah! Congratulations! What an incredible story..... I'm just speachless. Our bodies are so amazing and I hope you're feeling well this morning! Welcome to the world Norah! Sounds like your mama rocked your birth! Holy cow!!! Thats a birth story for the local news at least- you're totally my hero! And welcome to the world little miss Norah! She's so cute I cant stand it! Congratulations to you and your husband!!! YOU ARE INCREDIBLE! I love this story! Not how you imagined it, I bet! WOW she is beaufitul - Congratulations! WOW!!!!!!!!!! Congratulations, Mama! She is just beautiful! Holy smokes mama! Congratulations!! She's beautiful and I'm so happy for y'all! Whoah! You are so amazing. And she is beautiful! Congratulations! Congrats! That is awesome that you were able to do it by yourself, I would be freaked out! WOW! WOW! WOW! What an incredible story. CONGRATS!! She is GORGEOUS! I hope you are both felling well! HUGS! Wow! How exciting! She is beautiful! I hope everyone is feeling well! Oh. My. God. Wow. So many congrats! And I love the name Norah. How exciting! Sooo happy for you!! Congratulations!! You are a certified badass lady! Congratulations on your little one-She's adorable! I hope recovery goes well for both of you. What?! You delievered your own baby?! You are officially my hero. Congrats she is so adorable!! !